The Morcellator: Massive Medical Mistake? The Wall Street Journal recently w rote an article on a medical device that is causing injuries to unsuspecting women and the FDA’s quick response, historically, to approve these devices. The device—a morcellator—could be the reason behind some women developing advanced stage cancer and an aggressive uterine cancer. 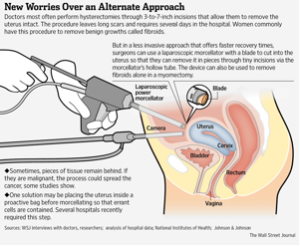 A morcellator is a surgical instrument that doctors use in laparoscopic (minimally invasive) surgeries, including hysterectomies and myomectomies (removal of uterine fibroids, or noncancerous growths). The device looks simple, with a handle and a tube shaped body that extends out. At the end of the tube is a blade. The doctor will make an insertion into the abdomen down to the uterus and insert the device inside the body. The bl ade then slices up, or morcellates, the specified body tissue into small pieces. The sliced tissue (uterus or fibroid) is then removed from the body. The device is often used by gynecologists because of its ability to provide faster recoveries than open surgery. The FDA began approving morcellators back in 1991, and over the years the FDA has approved at least 10 additional types of morcellators from multiple companies, according to the WSJ. Manufacturers of some morcellators have instructed doctors to use a bag with it when they believe the tissue may be cancerous; however, doctors usually cannot detect cancerous cells in the uterus until after the tissue has been removed. Johnson & Johnson is a popular manufacture of the power morcellator. It created the FemRx morcellator, which was approved in 1998, and became America’s most widespread morcellator. In 2000, the FDA approved a morcellator by Johnson & Johnson specifically for hysterectomies. What is problematic is that the FDA approved morcellators through a process referred to as a 510(k) review, or a premarket notification. The Center for Devices and Radiological Health reviews all 510(k) submissions for medical devices. According to the WSJ article, the original purpose of the 510(k) review was to “grandfather in” certain medical devices substantially similar to devices already approved prior to the enactment of federal laws requiring stricter reviews. The FDA is using this process for any medical device substantially similar to a device already approved. Therefore, these reviews do not require controlled human tests that most drugs and devices are required to undergo for FDA approval. The FDA has released an advisory regarding morcellators, noting that the use of these devices “poses a risk of spreading unsuspected cancerous tissue, notably uterine sarcomas, beyond the uterus.” The FDA has “discouraged” the use of these devices during a hysterectomy or myomectomy. 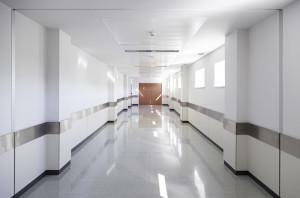 In informational updates from April and November of 2014, the FDA provided warnings with respect to morcellators. Specifically, the FDA noted that about 1 in every 350 women who undergoes a hysterectomy or myomectomy to treat fibroids is found to have “unsuspected” uterine sarcoma. There is currently no reliable way to know whether a woman with fibroids may have a uterine sarcoma prior to surgery. The FDA stated that if a morcellator is used in women who may have unknown uterine sarcoma there is a risk of spreading the cancer within the abdomen and pelvis areas. This is because once the tissue has been cut sometimes pieces are left in the body and spread. The inability to ensure that all tissue is removed it what makes this device so dangerous. According to the FDA’s review of scientific literature, their analysis led them to believe that the presence of uterine sarcoma in patients is 1 in 352 and the presence of unsuspected uterine leiomyosarcoma, an aggressive uterine cancer, is 1 in 498. The FDA notes that both statistical estimates are higher than the clinical community previously thought. For more information on this device view this video by the Wall Street Journal. If you, or someone you know, has undergone a myomectomy (removal of fibroids) or hysterectomy (removal of the uterus) and were diagnosed with sarcoma or other uterine cancer after undergoing this surgery, please contact McDivitt Law Firm right away.